Is Credit Suisse Really in Jail? Credit Suisse’s guilty plea to a charge of tax fraud seems to be a major step forward for a Justice Department that was satisfied both before and after the financial crisis with toothless deferred prosecution agreements and large-sounding fines that were easily absorbed as a cost of doing business. A criminal conviction certainly sounds good, and I agree that it’s better than not a criminal conviction. But what does it mean at the end of the day? Most obviously, no one will go to jail because of the conviction (although several Credit Suisse individuals are separately being investigated or prosecuted). And for Credit Suisse, business will go on as usual, minus some tax fraud—that’s what the CEO said. A criminal conviction can be devastating to an individual. But when public officials go out of their way to ensure that a conviction has as little impact as possible on a corporation, it’s not clear how this is better than a deferred prosecution agreement. But the thing is, they’re not too big to jail. The regulators could have revoked their banking license without bringing on the end of the world. I make that argument in my Atlantic column today, but the basic point is that a solvent bank (and everyone says they’re solvent) can be wound down without spillover effects; if it can’t, it isn’t solvent to begin with. In the end, it seems like the Department of Justice has managed to take something that seems like it should have teeth—a criminal conviction of a corporation—and turn it into just another slap on the wrist. And so the world turns. This entry was posted in Op-ed and tagged Credit Suisse, financial regulation, law. Bookmark the permalink. Only two days ago I saw a talk on ted about the securities frauds…… summed up the current situation aptly….. FBI and other agencies were chasing mice, while lions were roaming the streets…………. They will just go right back on doing it too. The conventional wisdom is that the government cannot be too hard on the bank because it could lead to negative impacts on the financial system. 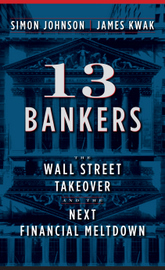 Nothing would happen to the financial system, however, if the top executives of the bank went to jail for ten years. Other executives would step into their roles but be somewhat chastened by what happened to their predecessors. The bad guys get punished, the system has the fear of God put into it, and everyone is better off, except for the guys in jail. As it is now, they pay a comparatively small fine, and the lesson learned is that anything is permitted as long as you are willing to put a little money on the table as a tip to the government if someone gets caught. This way, all the wrong lessons are learned, and everyone is worse off, except for the guys who would have gone to jail. Is it possible that the ineptitude of government with financial intuitions have something to do with the dollar going from 50% in 2000 to 30% of the dominating currency? Yes, but the Swiss have this rather attractive idea, practised in Switerland for Swiss residents liable to pay income taxes there, that taxes should be voluntary (they are made semi-voluntary, at least, by the bank secrecy rules). There was a Swedish economist writing at the beginning of the 20th century who did a lot of work on taxation and finally came to the conclusion that the only just tax was a voluntary tax. Ah, well, just another economist whose ideas are completely unrealistic, I suppose. Pity, though. If our regulators today (and under Clinton and Bush II) had “really” been regulators and made the criminal referrals essential to prosecuting the elite bankers leading the frauds and if our prosecutors were “really” prosecutors there would have been thousands of senior bankers convicted and the crisis could have been prevented. Note that the WSJ’s bankster obeisant account never seeks to refute the evidence that the three most financially destructive epidemics of accounting control fraud which drove the current crisis. If they were “really” regulators and prosecutors they would be demonstrating this point on a daily basis through their criminal referrals, enforcement actions, and criminal prosecutions of the elite bank officers that led the frauds. None of what we are seeing is being done to protect the “banks” (as opposed to the controlling bankers). DOJ could have always prosecuted, and the banking regulatory agencies could have sanctioned, the bankers responsible for the crimes. That would have posed zero risk to the banks.